Visitor Centre in St Davids from 24 February to 2 September 2018. 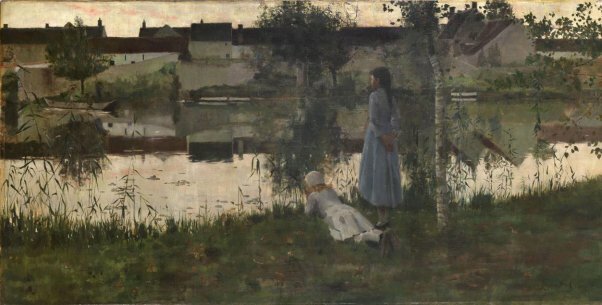 Le Passeur (The Ferryman) 1881, William Stott of Oldham (1857–1900). Photo © Tate. from The Wolfson Foundation) and The Hintze Family Charitable Foundation 2016.
commemorate the Year of the Sea in Wales. hidden meanings behind images of rural life and landscape. one of the most notable French Realists of the 19th century. number of paintings at the Paris Salon, which were much admired by French critics. exhibited at Oriel y Parc. City Art Gallery, Gallery Oldham and Aberdeen Art Gallery. exhibition, which was viewed by more than 30,000 people in St Davids in 2016. Amgueddfa Cymru-National Museum Wales exploring rural life.